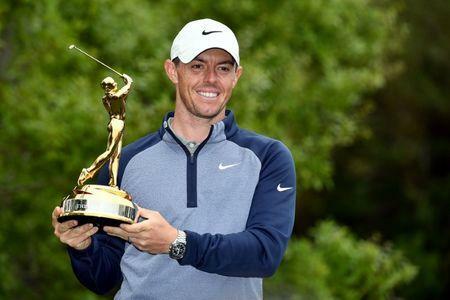 Northern Ireland's Rory McIlroy jumped two spots to No. 4 in the official world rankings on Monday, a day after claiming his first win in more than a year at The Players Championship. Dustin Johnson tied for fifth at TPC Sawgrass to maintain his slim margin at the top over England's Justin Rose, who managed to tie for eighth after rallying to make the cut. Brooks Koepka is No. 3, followed by McIlroy, who has steadily moved up since entering the year ranked eighth. He has yet to finish worse than a tie for sixth place in six events in 2019. No. 5 Justin Thomas and Bryson DeChambeau both moved down a spot, and were followed by Italy's Francesco Molinari, Rickie Fowler, Xander Schauffele and Spain's Jon Rahm in the top 10. England's Tommy Fleetwood and Australia's Jason Day moved past Tiger Woods, who dropped to No. 13 following his T30 at The Players. Former No. 1 Jordan Spieth missed the cut and continued his slide, falling another five spots to No. 30. He has three missed cuts and has not finished better than T35 in nine events since the second leg of last season's FedEx Cup Playoffs. --Phil Mickelson, who dropped a spot to No. 21 with his missed cut, has committed to the PGA Tour's new stop in at TPC Twin Cities in Blaine, Minn., this summer. The July 4-7 event outside of Minneapolis takes place three weeks after the U.S. Open and two weekends before the British Open. In a statement, Mickelson said the event was a "perfect slot" for his schedule.